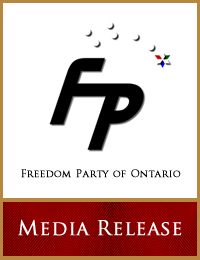 “…Freedom Party leader Paul McKeever is today objecting to the McGuinty government’s decision to give the taxpayer’s money to religious organizations…” Click here to read the full media release. “…Mr. Tory’s proposal harms efforts to achieve real tax relief because the proposal is based on a fraudulent assumption: that the health care premium was introduced to put more money into health care, rather than just to increase revenues overall…” Click here to read the full media release.